The passing of the one and only David Bowie was a tough experience for a lot of people in January of this year; myself included. I wrote a post on my top seven Bowie tunes (keeping it to seven because otherwise it would have spiralled out of control and I would have ended up listing his entire discography), but I haven’t yet. After Bowie passed away, I felt the urge to reflect on his body of work, including his films. I haven’t seen much of Bowie’s acting work, but one of my most treasured childhood films is Labyrinth (1986) – a fantastic tale of mystery and courage, directed by master of puppetry Jim Henson. For those who have never seen Labyrinth before, the film centres around Sarah (Jennifer Connelly), who is a somewhat bratty teenager with a short temper when it comes to her baby brother Toby (voiced by David Bowie, would you believe it). When Sarah accidentally wishes that Toby be taken away by the Goblin King Jareth (David Bowie), Jareth shows up and whisks him away. Sarah is then given thirteen hours to rescue her baby brother by making her way through a magical labyrinth, joining forces with a gang of friends along the way in a kind of allegory for growing up and learning about the responsibilities of adulthood and caring for others (kind of). As with many people who grew up in the late 80s and early 90s, I have a strong connection with this film because I had a copy of it on VHS (taped from television, of course) and used to watch it repeatedly. As a child, I loved the whimsy and unpredictability of the film, and always had a good laugh at whatever slapstick humour was on display. But when re-watching the film as an adult, I have found that there are different things that I appreciate. Here are five of my favourite things about Labyrinth. My favourite song of the film, despite its flippant approach to the physical discipline of children, ‘Magic Dance’ is so good because despite the fantastical setting of the film, the song is firmly rooted in the Bowie ethos of the 80s. All of the songs in the film could comfortably sit within Bowie’s discography which I absolutely love, but there’s something about ‘Magic Dance’ that is so fun to sing along with. It might be all the different parts sung by the goblin puppets. I also really love ‘Within You’, a song located further towards the end of the film. David Bowie really is perfect as Jareth the Goblin King. David Bowie’s tights cop a lot of interest throughout Labyrinth, but the costume design (and puppet design) throughout the whole film is so beautiful. From Sarah’s billowy sleeves on her shirt that coincidentally fits both the 80s and the film’s magical setting, to her gorgeous gown worn during a pseudo-dream sequence, to Jareth’s iconic Goblin King garb, Labyrinth is filled with so much beautiful costume design to admire. As aforementioned, Labyrinth is one big example of amazing production design in terms of its costumes and set. There is very little animation in the film, with Jim Henson making use of predominantly practical effects and gorgeous set design for the characters to traverse within, which is so impressive. The titular labyrinth is one of my favourite things about the film because of its unpredictability – which I also enjoyed as a kid. When watching the film, it really feels like anything could happen; doors speaking riddles, little creatures popping up out of nowhere and flipping tiles around, optical illusions of secret entrances, stone faces that just want to get their job done. 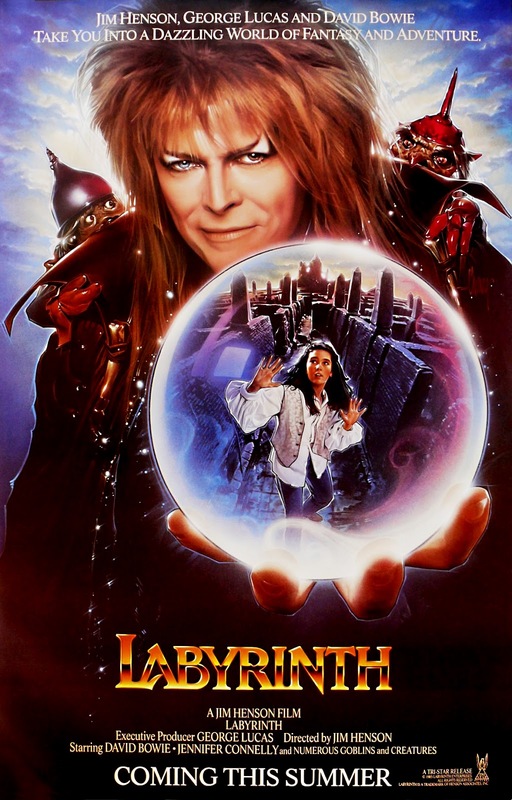 It’s also worth noting that David Bowie’s face as Jareth the Goblin King appears throughout the film in little secret locations, showing how ever-present the Goblin King is throughout his kingdom. It’s the little things throughout Labyrinth that add up to one big, expansive universe. When watching Labyrinth the other day, I was also struck with my love for one character named Ludo. Initially appearing as a fierce beast, Sarah soon finds that Ludo is a big, friendly monster with a heart of gold. It just strikes me that this is a really good message for kids; to look beyond a character’s (or indeed, person’s) physical presentation, to value their inner strengths, and not to judge a book by its cover. This is just one of the many really good messages for children that Labyrinth contains. Those are five of my favourite things about Labyrinth. Did you love this film as a child, do you still love it now? Let me know! I do love this film as not just for its art direction, Jennifer Connelly’s performance, the whimsical humor that is obviously a mixture of Henson and Monty Python, and its themes. It’s also because of Bowie as I think a lot of people’s favorite song from the film (aside from “Magic Dance”) is “As The World Falls Down” as it’s one of his most underrated ballads during a very polarizing period for him musically. Here’s my piece on the soundtrack as part of my 29 Days of Bowie series with links to the film and all of albums with the exception of live albums and compilations which I hope to get to next month. “As The World Falls Down” really is such a beautiful song, and totally underrated! Such a wonderful film. I can’t imagine anyone else as the Goblin King. Sounds like a good film to watch! It’s an amazing film for both kids and adults! Nothing like a classic 80s movie! And, of course, there really is nothing like David Bowie. The Man Who Fell To Earth and The Majestic are his most impressive movies, and don’t forget his cameo in Zoolander! It’ll b great to see u! I absolutely love Bowie’s cameo in Zoolander! I haven’t seen The Majestic either so I’ll have to pop it on the list for sure. Why thanks! I really do need to see The Man Who Fell To Earth, it sounds so intriguing. I didn’t see this until I was an adult but I absolutely love it. It’s so interesting because it seems like pepole who’ve seen this as an adult seem to have the same intensity of connection with the film as people who’ve seen it as kids. Just goes to show how much of an awesome film it is. Oh how I love this film. My favourite part is the scene featuring As The World Falls Down. It’s so dreamlike. I love that part too. Such a good film.